AIM 37th National Congress | GF ELTI S.r.l. This year GF ELTI was part of the 37th National Congress held at the prestigious Italian faculty of Architecture and Engineering in Bologna. The three-day-event coordinated by AIM, the Italian association for Metallurgy, focused on three major topics, specifically automotive, packaging, and general mechanics. This congress gathered a great deal of technicians and researchers from Italian universities. Throughout the days GF ELTI team met numerous people from industry and researchers from university and it had the opportunity to share its own values and corporate mission. The feedbacks received highlight the key role of GF-ELTI when it comes to pre-heating furnaces for Rolling Mills, furnaces and lines for Forging and Heat Treating. 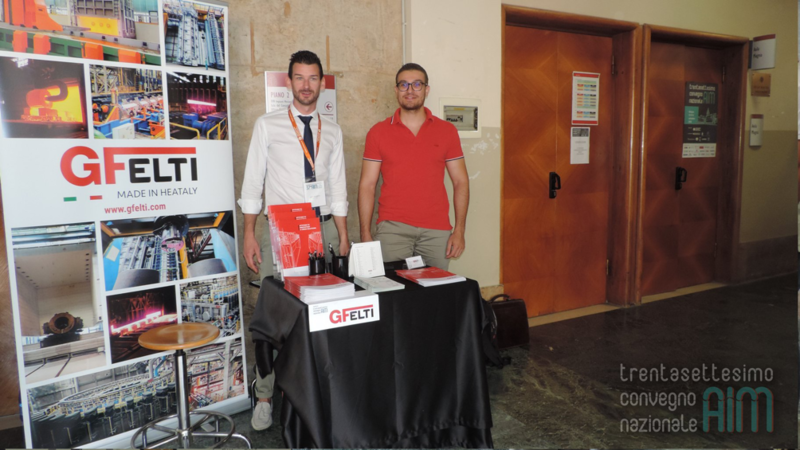 In the picture: GF ELTI Team at 37th AIM National Congress; from left Ivan Angeretti, Davide Macario.